For writers the long sentence is a hard thing to master. For readers it is a laborious thing to enjoy. Despite these difficulties, and despite the decades long reign of the lucid, short sentence structures of the likes of Orwell and Hemingway, the long sentence has become an important component of modern literature where it appears in mainly two different outlooks. There is the Proustian long sentence which today feels a bit archaic but is nonetheless popular partly thanks to its archaicness. It serves the needs of such acute psychologists as Alan Hollinghurst, creating the necessary linguistic habitat in which his characters and objects can be represented in their multi-faceted, cubist realities. Despite its intricate form this type of long sentence flows elegantly and musically. Then there is the more experimental, more modernist long sentence, which incorporates things like repetitions, lists, and digressions. It manifests a certain irreverence towards grammar and accepted ideas about what a proper modern sentence should be like. Writers such as Orhan Pamuk, Georges Perec, and Mathias Enard (his 2008 novel Zone consists of one, 528-page sentence) have employed this second type of long sentence for explorations of memory, history, and topography. 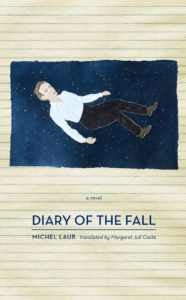 The moderately long sentences of Diary of the Fall, the new novel by Brazilian writer Michel Laub, fall somewhere in between those categories. They are formally experimental but also emotionally moving. How did Laub pull it off? On the face of it, Diary of the Fall is a very schematic novel. It features eight main chapters and Laub has implanted three chapters of Notes in between them. Those chapters bring to mind Milan Kundera’s essayistic novels where the narrative is chopped up into numbered paragraphs. The first chapter of Diary, “A Few Things I Know About My Grandfather”, has 38 subsections; “A Few Things I Know About My Father,” the second chapter, has 31, “A Few Things I Know About Myself” also 31 and so on. [“A Few More Things I Know About My Grandfather” (22), “A Few More Things I Know About My Father” (28), “A Few More Things I Know About Myself” (26), “The Fall” (35), “The Diary” (40)]. According to these numbers, the narrator knows more about his grandfather (38+22=60) than either about his father (31+28=59) or about himself (31+26=57). The numerical difference between those chapters is slight but significant and also a bit misleading. Reading chapters about things the narrator knows about himself, his father, and his grandfather, we realize how the only way for him to know his self is by way of knowing his father and grandfather. The narrator’s epistemology is directly linked to his genealogy. It must be clear by now that Diary of the Fall is a book about men in general and about a family of men in particular. The narrator’s grandfather is a Holocaust survivor who had arrived in Brazil “on one of those jam-packed ships, as one of the cattle for whom history appears to have ended when they were twenty, or thirty, or forty or whatever, and for whom all that’s left is a kind of memory that comes and goes and that can turn out to be an even worse prison than the one they were in.” There you have it: a Laub long sentence I picked from the very beginning of the book. Notice how it moves, elegantly, from the particular experience of the grandfather to that of a generation through the linguistic opportunities provided by the long sentence. “The sentence is the greatest invention of civilization,” John Banville pontificated in an interview with The Paris Review. The jury is out on whether the long sentence is the greater invention; here, at least, it serves the needs of the narrative particularly well. For a book that so strongly focuses on matters of genealogy and epistemology, the short sentence will simply not do. The book’s central figure, the grandfather, has spent his later years filling numerous notebooks with bland observations of life in Brazil. He has invented memories in order to be able to keep on living after his unspeakable experiences at Auschwitz. In contrast to his silence about anti-Semitism, his son had made the issue the center of his life, educating the narrator so that he can lead the same Auschwitz-centric life as himself. The narrator stands somewhere in between these radical positions of complete forgetfulness and constant remembrance. After coming to terms with the complicated legacy of Jewishness (that of being both elite and discriminated against, at least in his experience in Brazil) he ends up refusing to adopt his father’s discourse. The reason behind this change of attitude is a cruel prank against the only Catholic student in his elite Jewish school: an event that lies at the heart of this book. The narrator’s classmate, João, is a poor and reticent kid who finds himself continuously bullied by his Jewish friends at school. João’s father has to work at two jobs in order to make ends meet. As bus conductor and cotton candy seller the older man has worked hard and after the death of his wife did not marry again. Despite his problems at home and school, where he has enrolled through a scholarship program, João never complains about being bullied or discriminated against. His example, as a poor kid who is being treated like dirt in the present time, stands in stark contrast with middle aged men from privileged backgrounds whose complaints about ethnic discrimination are placed at the center of their lives. I don’t know if I took part because of those other classmates, and it would be easy at this stage to blame them for everything, or if at some point I played an active role in the story: if during the previous days I had an idea, made a suggestion, and was in some way indispensable if everything was to work out as planned, with us singing the last line together, happy birthday to you, before we gathered round him, one at each leg, one at each arm, with me supporting his neck because that’s the most vulnerable part of the body. Eyewitnesses have already recounted the story detail by detail, and there are sixty years of reports and essays and analyses, generations of historians and philosophers and artists who devoted their lives to adding footnotes to all that material in an effort to refresh yet again the world’s views on the matter, the reflex reaction everyone has to the word Auschwitz, so not for a second would it occur to me to repeat those ideas if they were not, in some way, essential if I am to talk about my grandfather and, therefore, about my father and, therefore, about myself. A different type of novelist would have trimmed the sentence into a dozen words and defend that choice; Laub’s narrator, in contrast, has lost his ability to write in short sentences. Whenever he wants to say something about the present, memories of the past enter the picture; the same thing happens whenever he wants to speak about the past. In such an assemblage of present and past memories, the long sentence comes to the rescue, offering subclauses to the narrator where time can be compartmentalized in such a way that the reader can easily discern lines which divide moments from one another. The reader gets used to the rhythm of Laub’s numbered paragraphs which are often made of one, two, or three sentences. Those paragraphs have the effect of a splash in the face; it is as if the author wants us to feel their freshness on our faces, and deciding against drying the water drops afterwards. In that sense, they are imperfect pieces of writing. No effort is shown to find the Flaubertian mot juste since the narrator aims to find the right memory, rather than the right word. At the end of the book the narrator realizes that however hard he tries, there is no avoiding Auschwitz, the full horror of which he explores through the writings of Primo Levi. That Laub can use the horror of Auschwitz and the tragedy of Alzheimer’s, the tense relationship between the acts of remembrance and forgetfulness in such an elaborate way in the canvas of such a short novel is quite a feat; Laub and his English translator Margaret Jull Costa have truly mastered the long sentence.